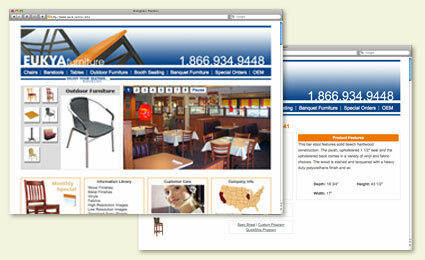 Project Description: The Eukya Furniture project was unique in that the client wanted an online catalog that was dynamic, with full CMS functionality and a few other requirements that made the project more akin to an ecommerce project without the check-out process instead of just a straight CMS project. Once the SDS team sat down and discussed the project it became clear that the client would be better served by taking our standard Magento ecommerce installation and removing the functionality they didn’t need instead of trying to take a CMS platform and adding functionality to it. The result was a unique Magento installation that has all of the powerful content management and reporting tools that SDS includes in every ecommerce project along with the excellent SEO capabilities of Magento. In the end, building Eukya an ecommerce website without the check-out functionality exceeded the project goals and gave Eukya a strong base to build future expansion on.